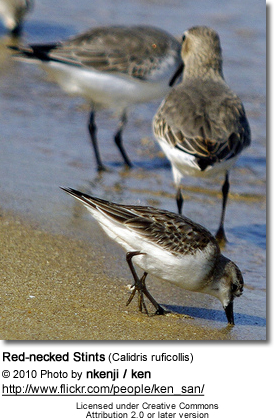 These birds are among the smallest of waders, very similar to the Little Stint, Calidris minuta, with which they were once considered conspecific (one species). The breeding adult has an unstreaked orange breast, bordered with dark markings below, and a white V on its back. 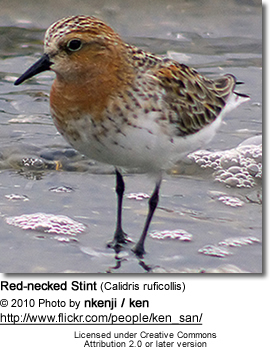 In winter plumage identification is difficult, although it is shorter legged and longer winged than the Little Stint. 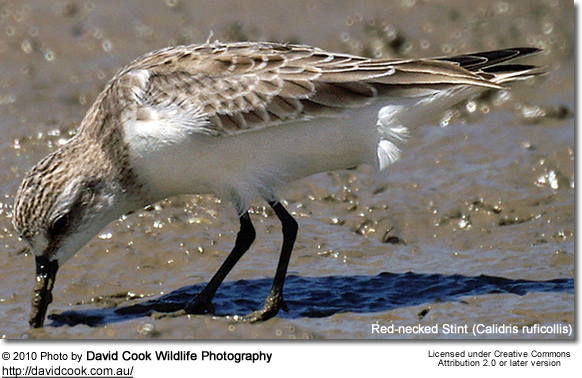 Juveniles have more contrasting mantle plumage and weaker white lines down the back than their relative. 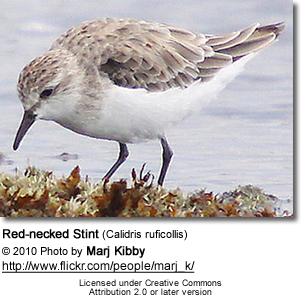 The Red-necked Stint's small size, fine dark bill, dark legs and quicker movements distinguish this species from all waders except the other dark-legged stints. 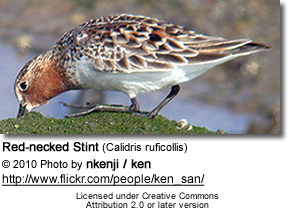 It can be distinguished from the Western Sandpiper and the Semipalmated Sandpiper in all plumages by its combination of a fine bill tip, unwebbed toes, and longer primary projection. The call is a hoarse "stit". 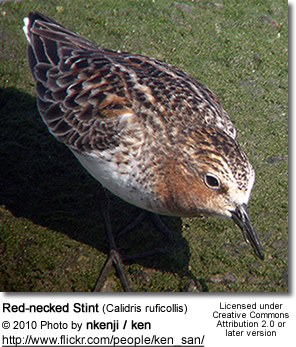 Red-necked Stints are strongly migratory, breeding along the Arctic littoral of eastern Eurasia and spending the non-breeding season in South East Asia and Australasia as far south as Tasmania and New Zealand. They are often seen in western Alaska and occasionally elsewhere in the Americas. 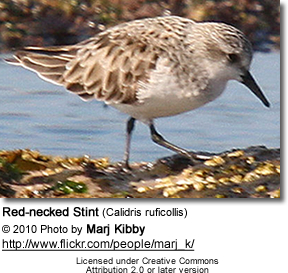 Red-necked Stints are highly gregarious, and will form flocks with other small Calidris waders, such as Sharp-tailed Sandpipers and Curlew Sandpipers in their non-breeding areas.